Macaroni and Cheese: It’s What’s for Thanksgiving! Last year around this time, I asked the folks on the fan page to tell me what sorts of foods they served at Thanksgiving. One person responded that they have macaroni and cheese. Ah! The idea of having macaroni and cheese for Thanksgiving excites me to no end. I am already enamored of carbohydrates, so getting to enjoy stuffing and mashed potatoes at the same time was thrilling enough. Or so I thought. Here in the South, macaroni and cheese is counted as a vegetable. Seriously. Look at almost any menu in any soul food/Southern cooking restaurant and check out the vegetable choices. You will almost always find macaroni and cheese listed. It’s a great last-minute dish because almost everyone owns Some Sort of Noodle and Some Sort of Cheese. My friend Jackie Gordon is making some right this very second, even as I type. Macaroni and cheese don’t need no reason. It is also providential that I just reviewed Melt: The Art of Macaroni and Cheese. 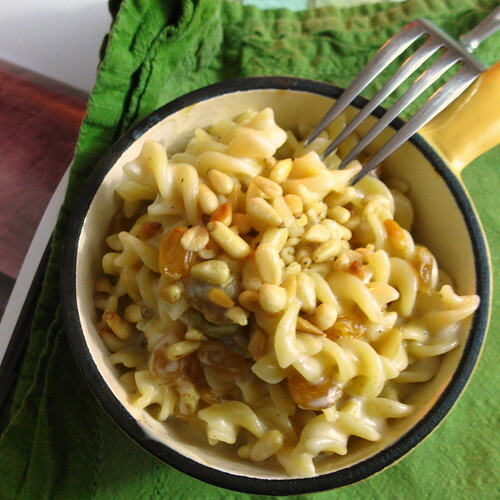 So many ideas for interesting pasta and cheese combinations, like the one I tried out: Grand Ewe with Golden Raisins, Pine Nuts and Macaroni. The Beloved and I both think that using dried cranberries in place of some or all of the golden raisins and a smattering of toasted walnuts rather than the pine nuts would be a welcome Thanksgiving variation. 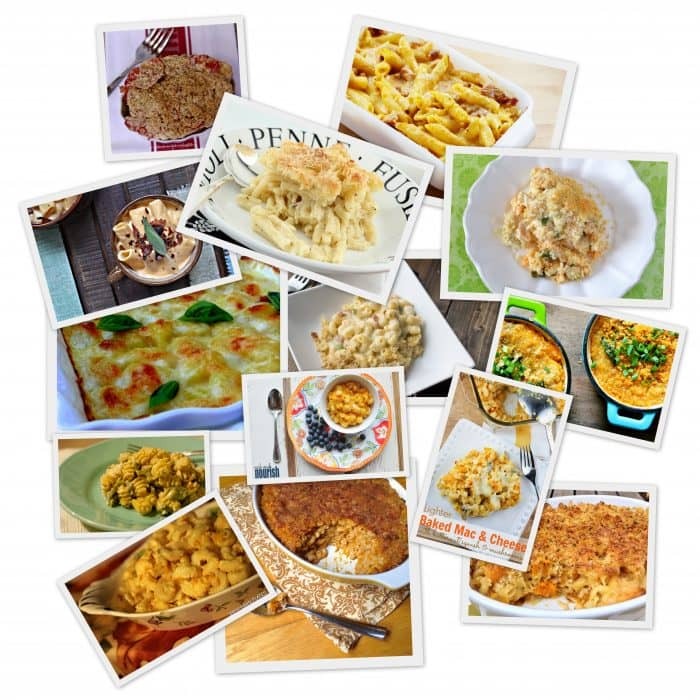 So, in the spirit of last-minute additions to your Thanksgiving table, I give you a round-up of some delicious macaroni and cheese dishes from blogger friends around the web. Enjoy! All photos used with bloggers’ permission. Thank you, all! Kale and Mushroom Quinoa Mac and Cheese from What Jew Wanna Eat–featuring the Super “Grain” quinoa, this “mac” and cheese is creamy/cheesy/chewy and packed with protein. Mmmm. Pumpkin and Cider Stove Top Mac and Cheese from Bakeaholic Mama–creamy goodness with Cabot Extra Sharp Cheese, pumpkin and bacon. Nice! Butternut Squash Mac and Cheese from Nosh and Nourish–A stove-top version with a short but yummy ingredient list. The part of the cheese is played by American and Swiss cheeses. Healthy Baked Mac and Cheese with Pumpkin from The Lemon Bowl–A healthy baked version that uses whole wheat pasta, sharp cheddar and yogurt. Jalapeno Popper Mac and Cheese from Healthy-Delicious–Sharp cheddar, pepper jack and cream cheese. And jalapenos. How does one say no? One doesn’t! Jalapeno and Bacon Mac and Cheese from Dinners, Dishes and Desserts–a similar version of the above, but with more bacon, heavy cream and sharp cheddar/pepper jack/Monterrey jack cheese. Lovely! Hidden Veggie Mac and Cheese from Yummy. Healthy. Easy.–The hidden veggies are butternut squash and mushrooms. Delicious! Ina’s Macaroni and Cheese from Confessions of a Cooking Diva–Ina Garten’s rich baked mac and cheese with extra sharp cheddar, gruyere, bacon and tomato. Pumpkin Mac & Cheese from Emily Bites–a creamy, stove top version seasoned with nutmeg and mustard that’s quite healthy, too. Gnocchi Mac n’ Cheese from Noble Pig–quite possibly the best mac and cheese idea ever. Seriously. Baked Pumpkin & Ham Mac and Cheese from Sweet Anna’s–A baked version featuring ham, poultry seasoning, nutmeg and a blend of cheddar and jack cheese. Butternut Squash Macaroni and Cheese from Swirls of Flavor–Another baked mac and cheese featuring fontina and the creamy goodness of evaporated milk. Yum! Morton’s Macaroni & Cheese from Persnickety Plates–A gorgeous baked version with sharp cheddar, cream cheese, Parm and swiss. Rich and decadent. And there you have it friends. I think I have made an excellent case for having macaroni and cheese for Thanksgiving. What say you? If you already enjoy mac and cheese at your Thanksgiving table, huzzah to you! And if you don’t, don’t you think it’s about time that you started? I know I am! Thank you so much for spending some time here, and if you celebrate Thanksgiving, have a happy and safe one filled with family, friends and maybe even some macaroni and cheese! Yay cheesy mac! When I was growing up, I swear my parents counted it as a member of every food group. Jenni, when you talk about macaroni, I remember about my last dinner with macaroni. It’s macaroni bolognese. My friend and I want to try making an old recipe of bolognese (since we always buy instant bolognese), and it has a white wine in the recipe. Since wine is not easy to find in common market in my country and it’s little bit expensive, can you tell me why this ingredient is important and if I can change it with something else, what liquid that seems better? Is the white wine here same with another wine that usually we drink or it’s different? I mean the wine for food, not wine for drink. Another one, how about if we change with red wine, is the taste will change? Thanks Jenni. Wait for your response. You will get some flavor from the wine itself, but it will be fairly subtle, depending on how much you use. It will also bring a touch of acidity to the dish. The more important component is the alcohol in the wine that releases some flavor compounds that aren’t soluble in just water. IF it’s hard to find wine, it’s not strictly necessary, although you’ll lose a bit of flavor. Which you probably won’t even miss if you’ve never made it with wine before. Use just a splash of lemon juice or vinegar and some extra stock or broth to sort-of approximate the wine. Red or white doesn’t make too much difference if you’re putting it in a hearty meat sauce like Bolognese. It’s more of an issue, color-wise, in lighter dishes. White wine keeps sauces white. Red wine “disappears” in a red sauce. Hope this is helpful. Enjoy your Bolognese!